Nominal cooling capacity 377 ÷ 1499 kW. Nominal heating capacity 422 ÷ 1688 kW. 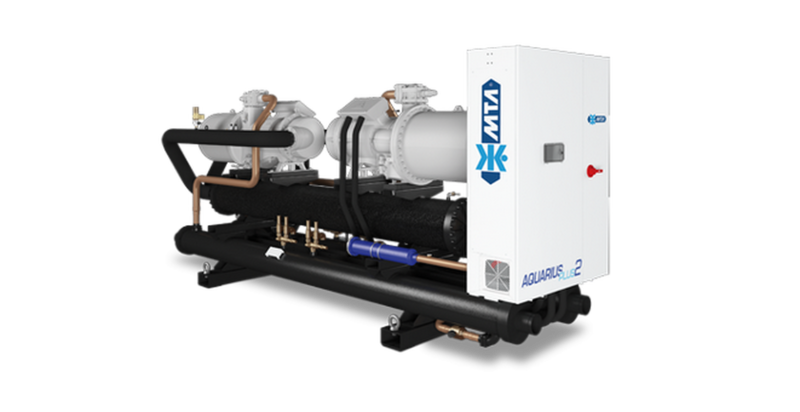 The Aquarius Plus 2 water cooled screw chillers are the best solution for commercial and industrial applications when requirements are reliability and performances. They are designed to meet market requirements in terms of versatility and energy efficiency. Stepless cooling capacity regulation, electronic expansion valves and high efficiency heat exchangers with integrated heat recovery systems, contributes to obtain high performance both at full load and at partial load with exceptional ESEER value. High-quality materials, advanced technical solutions and low running costs make Aquarius Plus 2, the best choice for big industrial and commercial systems.